TACLOBAN CITY – The National Capital Region Athletic Association for the fourth consecutive years, bagged the Palarong Pambansa 2009 championship crown. In order to set to rest the differing reports regarding the standing of the various Regional delegations, the official result was taken from the Palarong Pambansa record and documentation committee. The overall standing of the various Regional Athletic Associations put the National Capital Region as the champion, followed by Region 6, Region 4-A, Region 7 and Region 12 in the second, third, fourth and fifth places. Region 11 is in the sixth place while Region 10, Region 3, Region IV-B and Region 9 bagged the seventh, eighth, ninth and tenth places. While CAR is in the eleventh place, Region 1, ARMM and Region 8 are in the twelfth, thirteenth and fourteenth slots. Furthermore, Region 5, Region 13 and Region 2 are in the fifteenth, sixteenth and seventeenth places, respectively. The overall standing is the sum of the particular Region in the elementary and secondary divisions. For the elementary division, the champion is National Capital Region with 308 points while the second placer was Western Visayas or Region 6 with a total of 209 points. The third placer is Region 4-A or CALABARZON with 127 points and the fourth placer is Central Visayas or Region 7 with 109 points. Behind by only one point is fifth placer Region 12 or Cotabato Region which successfully retained its crown as being the best in Mindanao, with a total of 108 points. In the sixth place is Davao Region or Region 11 with 63.6 points followed closely by Northern Mindanao or Region 10, the seventh placer with 60.5 points. Region 3 or Central Luzon, Zamboanga Peninsula and Region 4-B or MIMAROPA bagged the 8th, 9th and 10th places. The Autonomous Region of Muslim Mindanao ranked 11th, the Cordillera Autonomous Region is number 12, Eastern Visayas ranked 13th, Region I or Ilocos Region bagged the 14th place. CARAGA is in the 15th place while Region 2 and Region 5 shared the 16th slot. Meanwhile, in the secondary division, the National Capital Region also got the championship crown with 280 points, followed by Region 4-A, Western Visayas, and Central Visayas in the second, third and fourth places. In the 5th place is Region 12; Region 9 in the 6th place; Region 3 in the 7th place; Region 10 in the 8th place; CAR, MIMAROPA, and Region 9, in the ninth, tenth, and eleventh places, respectively. Region 5, Region 1, CARAGA, ARMM, Region 8 and Region 2 landed in the twelfth to seventeenth places, respectively. TACLOBAN CITY – Bagong Alyansang Makabayan-Eastern Visayas (BAYAN-EV) condemns at the strongest possible term the violent assaults of the members of Philippine National Police - Region 8 and SWAT-Tacloban to the anti-GMA protesters (all members of BAYAN-EV) during her visit at the Palarong Pambansa in the city last April 28, 2009. “While waiting for our contingents from other municipalities, we decided to start our activity through a stage rally in the freedom park (RTR Plaza). As the program was going on, SWAT team leader together with five others, grabbed our streamers without prior notice/ negotiations. Ten minutes later, members of PNP-8 arrived and immediately assaulted our group. They vigorously beat, grabbed and choked us before we were brought to Tacloban City PNP Station”, Pong Acbo, Chairperson of BAYAN-Eastern Visayas, described the incident. “We don’t see violations on the activity we conducted since we have permit, we are in the Freedom Park, we are peacefully conducting our program and we are not impending the traffic; thus the arrest they (PNP) made is illegal”, Acbo said. “While we are in the PNP Station, the contingents we are waiting; arrived and pursued the activity. Some of our members who are in the PNP Station that time insisted to go out and join the protest since the PNP have no basis of holding us as we don’t have violation”, Acbo added. “The march rally was pursued but it is again violently assaulted by the joint effort of PNP, un-uniformed men, and SWAT team. Though most were uniformed, they are not wearing name plates, and again, no negotiation was made” said Kenneth Tiu, secretary general of Kabataan Partylist-Eastern Visayas. Twenty-five (25) members of different organizations affiliated to BAYAN were then detained at the Tacloban Lock-up cell for 12 hours. Reglamentary period lapsed and authorities were obliged to release them by 11:00 PM that same date – April 28, 2009. Mr. Acbo, called the assaults as GMA’s policy of violence to silence her critics. “What the PNP made unmasked GMA’s desperate cling to power even beyond 2010. She uses all means to silence her critics even illegal ways – from violent assaults, criminalization of political leaders, to extra-judicial killings”, Acbo lamented. “But Mrs. Arroyo is wrong that we will be silenced. Our voices will become stronger and broader”, Acbo concluded. QUEZON CITY – The Philippine Legislators’ Committee on Population and Development (PLCPD) announces the inclusion of Special Categories in the 5th PopDev Media Awards. In keeping with the changing times, this year’s Awards will include Citations for Blog (text) and Photo Blogs (Single Photo and Photo Essay) in recognition of the significant contribution of bloggers, or citizen journalists, in enriching the public discussion of population and human development concerns vis-à-vis socio-economic issues. A nomination scheme has been set up to encourage more bloggers or citizen journalists to join. Parties interested in nominating someone they know should fill up a nomination form and send it along with at least three (3) representative articles that were posted between August 16, 2008 and August 15, 2009. Upon confirmation of nomination, nominees should then fill up an application form and send it along with his/her choice of at least three (3) representative entries. Entries to the Citations for Blog (text) and Photo Blogs (Single Photo and Photo Essay) should have been posted between August 16, 2008 and August 15, 2009. At least three (3) representative articles are required for the Citation for Blog (text) while for the Citation for Photo Blog-Photo Essay, at least five (5) to 10 photos are required. Only entries from Filipinos and from sites originating from the Philippines will be accepted. The blog site should have also been in existence since at least January 1, 2008. Entries from professional journalists may also be considered as long as these were posted in their personal blogs. The 5th PopDev Media Awards is open to all print, broadcast, online, photo, and citizen journalists nationwide. For this year, in the context of the approaching Millennium Development Goals (MDGs) deadline on 2015, the International Conference on Population and Development (ICPD) 15th year celebration, and the upcoming 2010 elections, entries must be able to stress the importance of the MDGs and the ICPD as electoral issues that must be put in the public agenda. Interested parties may send as many entries in a chosen category. Winners of the major categories will receive a cash prize, trophy, certificate, and a chance to participate in a study trip to a PLCPD project area in the Philippines. For more information, interested journalists may visit the PopDev Media Awards webpage at www.plcpd.org.ph or contact the PLCPD secretariat at 925-1800 or 9266619. NAVAL, Biliran – Nineteen scholarships for college students are currently offered at the Naval Institute of Technology (NIT), the lone educational institution in the province of Biliran that offers college courses. 11) Barangay Scholarship offered to barangay officials, and children of barangay officials; 12) SK Scholarship offered to Sangguniang Barangay (SK) officials; 13) GAA or CHED Scholarship offered under the General Appropriations Act through the Commission on Higher Education (CHED) to poor but deserving students; 14) Staff Scholarship offered by the school to the children of its employees; 15) DSWD Scholarship offered by the provincial government of Biliran to poor but deserving students; 16) SAFE (Student Assistance Fund for Education) Loan is similar to the previous program Study Now, Pay Later Plan of the government which is offered only to 3rd, year, 4th year, and 5th year students; 17) Franciscan Scholarship offered by the Franciscan nuns to poor but deserving students; 18) One Town, One Scholar (OTOS) Scholarship offered to poor but deserving student in a particular municipality who is endorsed by the municipal mayor; and the 19) Socorro Foundation Scholarship offered by Mrs. Socorro Mocorro who is a retired registrar of NIT to poor but deserving students. Some 6,000 students are enrolled at NIT and BNAC campus in Biliran in its 30 courses in College of Arts and Sciences, College of Engineering, College of Technology, College of Maritime Education, Graduate School, and College of Law. A one-stop-shop enrollment is going-on at the NIT gymnasium to spare students from the upsetting enrollment process. The Regional Disaster Coordinating Council of Region 8 reported that the number of stranded passengers and vehicles continue to increase because although Region 8 has a fairer weather condition, the existence of “Dante” in the Bicol Region hinders the ferry from going to Matnog. Office of Civil Defense Director Angel D. Gaviola informed that per report of the Philippine Ports Authority in Tacloban, as of 7:00 o’clock in the morning of May 3, 2009, the stranded passengers at Looc Port have increased to 1,147 while the number of stranded vehicles increased to 113 which is broken down to 27 light cars, 29 buses and 57 trucks. On the other hand, at the Dapdap Port, the number of stranded passengers was pegged at 644 while the number of stranded vehicles increased to 38. The number of stranded vehicles is broken down to 11 light cars, 17 buses and 10 trucks. The number of ships on hold at both port is only one each. Although no other disaster related incidents were reported to RDCC 8 Operations Center at the Office of Civil Defense Region 8, the RDCC will continuously monitor the effects of tropical depression “Dante” in Region 8. Meanwhile, the Philippine Ports Authority in Tacloban City headed by Port Manager Winfred Elizalde continues to closely monitor the ferry operations at all ports in Region 8. The weather in Tacloban remains to be cloudy with scattered rain showers. Per PAGASA report, at 2:00 am today, Tropical Storm "DANTE" was estimated based on satellite and surface data in the vicinity off coast of Northern Catanduanes or 130 kms East of Daet, Camarines Norte with maximum sustained winds of 65 kph near the center and gustiness of up to 80 kph. It is forecast to move North Northeast slowly. PAGASA reported that Catanduanes will have stormy weather with rough to very rough seas while the rest of the Bicol Region, Masbate including Burias Island, Southern Luzon including Polillo Island and Northern Samar will experience rains and gusty winds which may trigger flashfloods and landslides and the coastal waters along these areas will be moderate to rough. LEYTE SPORTS DEVELOPMENT CENTER, Tacloban City – The sky around the oval here is overcast today, but the sun was up just in time for the much-awaited fight between Pinoy Manny Pacquiao and Briton Ricky Hatton for the light welterweight crown. The actual fight was in MGM Grand Hotel, Las Vegas, Nevada, but it is beamed live here and can be seen by everybody in real time through the big screen that was put up in the roof in one of the grandstands, east side, courtesy of Leyte Governor Jericho Petilla. All told, the athletes, officials, and the common folks, the sector where the now legendary Pacman came from, were allowed to get inside the secluded oval if only to get a glimpse, cheer, and root for their idol. By 11:30 the bout began, complete with the usual ceremonies of anthem singing and introduction. By 11:50, it was all over. Pacquiao finished the boxing bout as swiftly as he can in under thirty seconds before the end of the second round, with a strong left hook to the jaw of Hatton, sending him down with his back in the canvass. Referee Kenny Bayless did not even bother to count. But it could have ended much earlier, in the first round, when a lightning flurry of punches floored the Briton twice, had not the bell sounded. “I didn’t expect a short fight. He hit me hard, I was lucky to have hit him with a right hook. He was surprised with my right hand. Yes, he was strong, and I was careful not to be hit,” said Pacquiao in an interview right after the fight. The thousands of spectators in the LSDC oval, the rest of the country and around the world throw fists in the air in celebration everytime the Briton was hit, and after the ring announcer formally announced the TKO in so short a time. And the victory certainly made everybody’s day here in the closing moments of the Palarong Pambansa 2009. TACLOBAN CITY – The holding of the Palarong Pambansa 2009 in Leyte is unanimously cited by the delegations as well as the onlookers, as very successful, enjoyable and full of firsts. After a brief timeout in order to watch the Pacquiao-Hatton boxing match, thanks to Governor Carlos Jericho Petilla who provided a satellite pay-per-view telecast live, the championship matches of several events continued. At 4:00 o’clock in the afternoon of May 3, the Awarding Ceremonies will be conducted at the Leyte Sports Development Center. Right after, all the delegations will be treated to a “Paalam Night” courtesy of Leyte Governor Carlos Jericho Petilla and the League of Municipalities of the Philippines led by Tanauan Mayor Roque A. Tiu. As expected, the National Capital Region bagged the overall championship crown both in the secondary and elementary division. In the secondary division, far second is Region 4-A followed by Region 6 or Western Visayas, Region 7 or Central Visayas, Region 11 or Davao Region, Region 12 or Cotabato Region, Region 3 or Central Luzon Region, CAR, and Region 4-B in the top ten delegations. In the elementary division, NCR is followed by Region 6, Region 4-A, Region 12, Region 7, Region 11, Region 10, Region 4-B, Region 3 and Region 9 in the top 10 positions. It was observed that the other Regions could beat the National Capital Region if they will put their hearts into it. Archery Boys in the secondary division, for example, was won by Region 9 or Zamboanga Peninsula Region while the archery girls was lorded by a young lass from Region 10 or Northern Mindanao Region. Region 12 lorded over other delegations in the Arnis boys and girls secondary division while Region 4-A excelled in Athletics Boys Secondary Division followed by Region 6. In the Athletics Girls secondary division, it was the other way around with Region 6 emerging as champion, followed by Region 4-A in the second slot. Badminton Boys, Gynastics MAG and Baseball events were dominated by Region 4-A while Boxing was dominated by Region 11, Sepak Takraw by Region 7, Softball by Region 6 for the 5th consecutive years, Table Tennis Boys, Volleyball Girls by Region 6, Taekwando Girls by CAR, Tennis Boys by Region 10 and Tennis Girls by Region 4-A. The NCR secondary athletes emerged as champion in 8 events particularly Basketball, Chess Boys and Girls, Gymnastics RG (Rhythmic Gymnastic), Gymnastics WAG (Women Artistic Gymnastics), Swimming Boys and Girls, Table Tennis Girls and Taekwando Boys. In the Elementary Division, NCR dominated in ten events namely, Badminton Boys, Baseball, Basketball, Chess Girls, all the 3 categories in Gymnastics, Softball, Swimming Boys, Table Tennis Girls, and Taekwando Girls. Region 6 lorded in 6 events, Athletics Boys and Girls, Badminton Girls, Sipa and Table Tennis Boys. Region 4-A won the Boxing, and Swimming girls events while Region 11 won the Chess Boys and Tennis Girls events, Region 10 won the Tennis Boys event, ARMM won the Volleyball Boys while Region 7 won the Volleyball girls event. All the Palarong Pambansa delegations, however, won the love and admiration of the Leyteños and the whole country for their sportsmanship and determination to win not only honors but friends for their respective regions and for the country Philippines. TACLOBAN CITY – Senator Richard Gordon, Chairman and Chief Executive Officer (CEO) of the Philippine National Red Cross (PNRC) revealed that he plans to open a Red Cross center in every barangay throughout the country. In a press conference with PIA and members of the private media in Tacloban City at the MacAthur Park Hotel Beach Resort in Palo, Leyte on Wednesday (April 29), he said that this is one way of keeping in touch in every barangay in the event disaster or calamity occurs. He explained that the Red Cross center to be opened in a barangay is a quick response mechanism that will send immediate report to PNRC, things such as preventive measures to be undertaken by the community in times of emergency, the extent of the damage, the kind of assistance that will be extended and the immediate actions as a response in times of calamity or disaster. This can be done effectively and efficiently with the aid of cell phone and other modern digital communication facilities which can immediately transmit reports and information across the country in just seconds, Senator Gordon said. He shared some important related statistics which is of important value to the center like the number of cell phone owners in the country that reached to 27 million, sending about 2 billion text messages a day. The PNRC Chairman further said that the Red Cross center in a barangay will be manned by a leader and about 43 to 44 volunteers. “These volunteers will serve as eyes and ears of PNRC in the community or at the grassroots level relative to the quick action responses that will be made in times of calamity or disaster”, he added. The PNRC Chair told several stories of the quick responses made by PNRC to communities in the country affected by disaster or calamity through their volunteers. However, he said that their volunteers in the field are not enough to cover the entire country at present especially in remote barangays where there were no Red Cross volunteers. “The country needs it” Senator Gordon referring to the relevance and importance of opening a Red Cross center in every barangay all over the country. TACLOBAN CITY – Pound by Pound King Manny ‘Pacman’ Pacquiao will give a P1Million incentives to the athletes of Region 12 who will win in their respective events in the Palaro 2009. 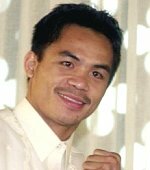 Department of Education Region 12 Assistant Regional Director Allan Farnacio was quoted as saying that the secretary of Manny Pacquiao called up the Region 12 delegation to relay Manny’s good luck wishes and to inform about the P1Million incentives which Manny will send to the athletic delegation. Manny’s incentive seem to have a great impact on the Region 12 athletes as Omar Dacerra, a sixth grader from Notre Dame of General Santos broke a Palaro record in the swimming event particularly in the 200 meter free style for the elementary boys. The Region 12 swimmer recorded a 2:10.34 which broke the old record of a National Capital Region swimmer of 2:11 in Palarong Pambansa in Palawan last year. During the Solidarity meeting, Region 12 Director Luz Almeda vowed to give cash incentives to the gold medalists in the delegation. It was observed that the first ever recognition for Region 12 is their well-applauded “Saludo” during the formal opening of the Palarong Pambansa on April 28. With the high spirited and well-motivated Region 12 athletes, the delegation of the Cotabato Regional Athletic Association in blue and yellow striped uniforms is optimistic that it will inch its way surely to more wins and recognitions. Among the inspiring fete of the Region 12 delegation is an outstanding athlete, Domingo Cabradilla, an 18 year old lad from the Tuna Capital of the country, Gen Santos City who got silver medal in long jump earning him some 5 points. An early gold was captured by John Albart Mantua, in the shot put event for secondary boys. Another impressive performance was observed in athletes John Rey Miguel, Jerome Magna and Nomer Buenavente who earned 30 points in arnis and placing second only to Western Visayas. TACLOBAN CITY – Secretary Jesli Lapus of the Department of Education (DepEd) in a press conference early on Tuesday, April 28, 2009 at the Leyte Park Hotel said that this Palarong Pambansa being held in Tacloban City, Leyte has many firsts. For one, the games have already started before the opening ceremony was held, organizers timed the opening on the second day of the games for the visit of President Gloria Macapagal-Arroyo and Vice President Noli de Castro. Another first that DepEd claimed was the provision of mattresses to athletes billeted in public schools and other government buildings in Tacloban City and nearby towns. Other DepEd officials also said that on-line results of the games are accessible to the media and the general public with access to internet. DepEd Regional Director Sol Matugas also added that a parade on the final day will be done and unlike other Palarong Pambansa where the grand parade is done on the very opening of the games. UnderSecretary Ramon Bacani also shared about the budget adding that some P130M has been allotted for this big sports event. Meanwhile, UnderSecretary Teodosio Sangil thanked the teamwork of Matugas and Leyte Governor Jericho Petilla whose government also shelled out some millions to improve the facilities of the Leyte Sports Development Center. DepEd also took pride in mentioning that the quarters of the different athletes have been screened and that fire trucks are on standby to address the water requirements of the 10 thousand athletes from 17 regions who came in droves to participate in the biggest event in Leyte for the last 25 years. President Gloria Macapagal-Arroyo in her brief message said that it is also an extra ordinary event for her to come with the second highest official Noli de Castro to grace the big event. TACLOBAN CITY – In a move to further boost the business and economic development of Leyte, President Gloria Macapagal-Arroyo issued on April 28, 2008, a presidential proclamation creating the Kananga Special Economic Zone. The issuance of the Presidential Proclamation was disclosed by Press Secretary Cerge Remonde, who is currently acting Executive Secretary, during a press briefing following a regional cabinet meeting held at the VIP Lounge of the DZR Airport in Tacloban City. “For an opening statement, I am very happy to announce a good news especially for the people of the province of Leyte. This is the issuance of presidential proclamation, creating and designating two parcels of land situated at Barangay Montecillo, Kananga, Leyte, as a special economic zone,” Secretary Remonde said. The proclamation is pursuant to to Republic Act 7916 otherwise know as the Special Economic Zone Act of 1995 as amended by RA 8748, and Executive Order No. 661 dated September 10, 2007 directing the local government units in areas near or adjacent to geothermal-producing sites in Albay, Laguna, Leyte, Negros Oriental, Sorsogon and Albay, North Cotabato and Negros Oriental to develop economic zones. Declaring certain areas adjacent to these geothermal-producing sites as economic zones will provide alternative locations for investors. A Special Economic Zone (SEZ) is a geographical area that has economic laws that are more liberal than a country's typical economic laws. The category 'SEZ' covers a broad range of more specific zone types, including Free Trade Zones (FTZ), Export Processing Zones (EPZ), Free Zones (FZ), Industrial Estates (IE), Free Ports, Urban Enterprise Zones and others. Usually, the goal of an SEZ structure is to increase foreign investment. 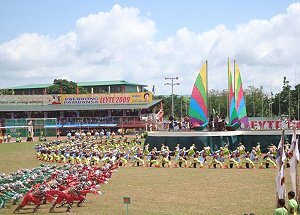 President Arroyo was in Leyte on April 28 upon the invitation of Leyte Governor Carlos Jericho Petilla in order to open the Palarong Pambansa 2009 which the province is hosting together with the Department of Education Region 8. Upon arrival at the DZR Airport, President Arroyo led the ground breaking of the airport terminal project which will enhance Tacloban City as the gateway of Eastern Visayas. The construction of the airport terminal building is expected to start this year. TACLOBAN CITY – President Gloria Macapagal-Arroyo led the groundbreaking ceremony on Tuesday for the new Daniel Z. Romualdez Airport Terminal building here and lowered the time capsule of the proposed P155 Million airport terminal on a 4,899.96 square meter portion of the airport complex. The President proudly announced that already underway is the asphalt overlaying of runway and construction of shore protection in the amount of P625.5 Million which is due to be completed by August, this year. The Tacloban Airport Development Project will serve as the gateway for Region 8 to all over the world and become one of the country’s secondary international airports. The total funding requirement for the project is P4.13 Billion, the President said. President Arroyo looks forward to the establishment of an international airport in the region as a strong tool for the promotion of the local tourist destinations which would eventually make Biliran and Limasawa Islands as Boracay for Eastern Visayas, she added. The existing alternate international airports in the country are in Laoag City, airport in Ilocos Norte, General Santos City, Zamboanga City and Davao City. In the Eastern Visayas, the Tacloban Airport is considered a “trunkline” airport while secondary airports in the region are in Catarman, Calbayog and Ormoc. On the other hand, “feeder” airports are operating in Biliran, Borongan, Caltbalogan, Guiuan, Hilongos and Maasin. The other components of the project to be implemented include the installation of air navigational facilities costing P230 Million and the acquisition of lots for the expansion of the total land area of the airport terminal complex. A total of P130 Million has been earmarked for land acquisition. After the groundbreaking and lowering of the time capsule, the President had a regional one-on-one media interview where she announced the release of the royalty shares to local government units of the geothermal power generation still at the groundbreaking site, Tacloban City Airport. TACLOBAN CITY – SAGUPA-SB strongly condemned the brutal and violent way of dispersal of the Central PNP and SWAT to the progressive group lead by BAYAN-SB at Freedom Park of Tacloban City. The Arroyo regime conceal the legitimate demand of the people thru harsh dispersal and by putting behind bar of the 25 mass leaders of progressive group. Bagong Alyansang Makabayan- Sinirangan Bisayas (BAYAN-SB) protest principally for genuine land reform, extra-judicial killings, economy crisis and widespread corruption of the Arroyo regime. It only shows that the US-Arroyo regime is the number one violator of human rights not only here in region 8 but nationwide. “The protesters were forcefully dragged and their sound system, video camera, placards and streamer have been destroyed. The action of the authority is a violation to the law. The SWAT and PNP treated the protesters more than a terrorist. Its only right to be ashamed and to protest the visit of Gloria Arroyo’s because she try to hide her evil acts especially the worst corruption in her regime and extra-judicial killings of her critics” says Robert Dela Cruz, information officer of SAGUPA-SB. Dela Cruz narrated that this is the only regime in the history that faces many scam, corruption, and worst human right violations. Her statements on economic progress and peace in the country are all false and nonsense. But people see only the progress of her family and its crony. “The people and other sector in our society must condemn the inhuman treatment made by government forces to the activist. The Commission on Human Rights (CHR) must investigate the said incident and GMA should be liable for human rights violations. Fight the fascist US-Arroyo regime!” ends Dela Cruz. TACLOBAN CITY – For the first time, the country’s two top officials – President Gloria Macapagal-Arroyo and Vice-President Noli de Castro – attended a national event together by gracing the Philippine Palarong Pambansa 2009 which opened Tuesday at the Leyte Sports Development Center. 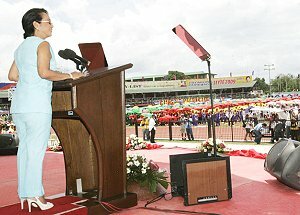 “Ang Palarong Pambansa ay programang prayoridad kaya narito tayo lahat ngayon, kaya narito ang inyong pangulo at bise pangulo na karaniwan, for security reasons, hindi nagkakasama sa isang event,” President Arroyo declared during her more or less 10-minute speech to formally open the Leyte hosted Palaro 2009. Hosted by the provincial government of Leyte and organized by the Department of Education (DepEd) Region 8, the country’s 17 regions were well-represented in the opening that was marked by colorful dance presentations honoring the local culture as well as the parade of colors by the respective delegations. President Arroyo arrived just as the whole 17 Palaro athletic delegations completed their entrance of colors to the LSDC grounds. In her short message, President Arroyo congratulated the provincial government of Leyte for hosting the biggest sporting event in the country. “Congratulations sa probinsiya ng Leyte - sa pinakamalaking event sa Leyte sa nakaraang 25 years,” the President said. She further emphasized this sport gathering is a priority program of the national government to develop character, discipline, self-esteem and teamwork. “These are qualities that we need as a nation. Ito ay bahagi ng isang komprehensibong programa na tutulong para magkaroon ang ating bansa ng mga katangian na puedeng humarap sa mga immediate challenges na nanggagaling sa krisis ng buong mundo pati na rin ang ating saligang pag-unlad na ikabuibuti naman ng ating kabataan ngayon,” President Arroyo declared. He challenged the athletes, coaches and other participants to “play fair and play well” as the country pins its hopes on the Palarong Pambansa for the discovery of new sports talents that may represent the country in international sports and become future Olympians. The events being competed in the Palaro 2009 include archery, athletics, badminton, basketball, boxing, chess, football, gymnastics, sepak takraw, table tennis, taekwondo, lawn tennis and volleyball. The secondary division also features baseball, softball and swimming for the secondary division. Traffic leading to the Leyte Sports Development Center began as early as 8:00 in the morning as people went in droves to the sports arena to get the best spots to watch the opening. People had to walk the rest of the way as some routes near the central Palaro venue was closed to traffic to make way for better parking of VIP vehicles, particularly the presidential entourage. Traffic may have been tight but business was brisk in the stalls and stores set up nearby and around the Leyte Sports Development Center. Stalls put up displays a range from food and drink stands, souvenir shops and other item stores. Meanwhile, police and military authorities and traffic volunteers were highly visible around the venue as well as in other strategic locations around the city. The PNP in Leyte province, the regional office as well as the city have earlier assured to maintain police visibility and guidance to make sure that the Palaro will be smooth and peaceful. TACLOBAN CITY – The big crowd is attracted to stay put in the bleachers despite the scorching heat of the sun the whole morning and the sudden heavy rains in the afternoon enveloping the environment of the newly-refurbished Leyte Sports Development Center as the different awe-inspiring and eye-catching spectacular shows paraded before the eyes of the crowd during the opening ceremony of the 2009 Palarong Pambansa. Aside from the arrival of President Gloria Macapagal-Arroyo which is predominantly a big crowd drawer in any national event she attended in, the lovely voice of Ms. Gretchen Espina, the first Pinoy Pop Idol and the daughter of Biliran Governor Rogelio J. Espina captured the crowd’s attention as she sang the Philippine National Anthem. Nobody can resist or not tempted to take a very close look of how the Buyugan Festival performed as it really mesmerized the attention of the big crowd including the highest official of the country, President Gloria Macapagal-Arroyo and her party who left right after the very colorful and wonderful presentation of the national winner of the 2009 Aliwan Festival. Not to be outdone was the awe-enticing two-minute presentation of each of the 17 participating delegations in their regal and colorful uniforms trying to outdo in their performances in front of the stage of the LSDC where the VIPs were seated. The two-minute presentation depicts the rich arts, culture and traditions of each of the delegations. What also made the big crowd more excited was the high-tech and state-of-the art lighting of the urn which signified the start of the weeklong sports tournament. The athletes who brought fame and glory in region 8 to the national games lighted a pyrotechnic gadget that traversed to the adjacent side where it directly ignited the flame of the urn. The air space of the LSDC was not spared with the heavenly attractions as some few air daredevils jumped from a plane and glided into the oval with one landing unfortunately out of the landing area. Colorful hot air balloons also flew in the LSDC air space in swift stride going up in the air inviting attention from below to look up high. Generally, the opening ceremony of the 2009 Palarong Pambansa here in Leyte only showed the inherent character of the people in Eastern Visayas like their incomparable hospitality coupled with offering wholesome entertainment that attracted the young and old and all the people from all walks of life not only in the region but to all the visitors and guests who witnessed the opening ceremony today.